Imagine one software application so flexible that it could acquire and analyze data for a wide variety of life science experiments, so powerful that even the most detailed analysis could be completed automatically, and so easy-to-use that researchers at all experience levels would find it intuitive. The AcqKnowledge data acquisition and analysis software included with each MP System is an interactive, intuitive waveform analysis program that lets you instantly view, measure, analyze, and transform data. 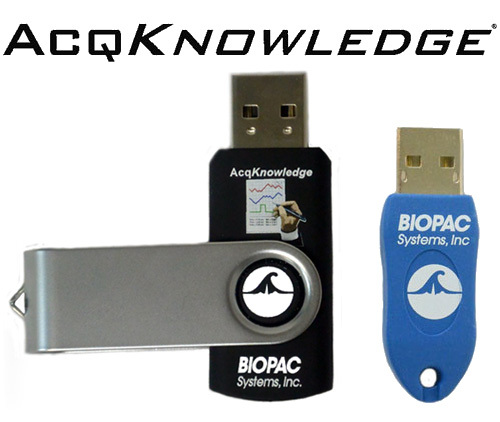 AcqKnowledge is the software component of a complete research system, included with BIOPAC MP160 and MP36R data acquisition and analysis platforms and providing advanced analysis for multiple applications and a broad range of signals and measurements. Watch Demo & Tutorial Screencasts now to learn more about AcqKnowledge acquisition and analysis features. With AcqKnowledge, you can perform complex data acquisition, triggering, and analyses using simple pull-down menus and dialogs—no need to learn a programming language or new protocol. AcqKnowledge software includes fully automated analysis routines for most physiological signals! For ECG data, utilize the automated HRV analysis or locate and mark ECG complex boundaries for both human and animal signals. Take advantage of multiple routines available for EEG, EDA, EMG, and Respiration. Look at RSA or perform a detailed ICG analysis with a few clicks of the mouse. Use AcqKnowledge to save time and standardize analysis protocols.